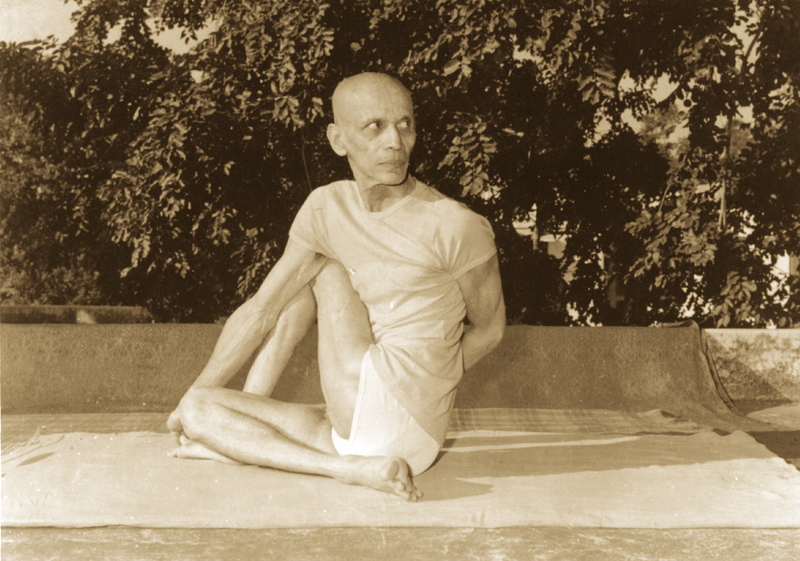 Matsyendra here refers to the Rishi or the teacher who first taught this Asana. Sit on the floor with legs stretched out. Bend the right leg at the knee and set the heel firmly against the perineum. Bend the left leg at the knee and lifting it from the floor with the support of the hands, place it by the side of the right thigh so that the left outer ankle touches the outer right thigh. Be secure in this position and keep the shin perpendicular to the floor. Now turn the trunk 90 degrees to the left, so that the right armpit touches the outer side of the left knee. Passing the right hand over the left knee, firmly catch hold of the left big toe with the right hand. Swing the left hand back and bring it round the right side of the waist to catch the right thigh. Turn the head over the left shoulder and direct the gaze over it. Give a full twist to the spine and stiffen the position. Retain the posture with normal breathing. Concentrate on the spine and the flow of breath. Remain in the posture for thirty seconds to one minute, and gradually increase to two to three minutes and then release. Repeat the same process by bending the left leg. A steady practice of this Asana cures lumbago and other muscular pains of the back. The spine is made elastic. The muscles and organs of the abdominal region are massaged. The roots of the nerves at the spine and the sympathetic system are toned up with a good supply of fresh and pure blood. Constipation and dyspepsia are removed. The nervous system and the vertebrae of the spinal column are given good exercise and they are toned up.